OAKLAND — Members of a violent faction of Your Black Muslim Bakery, including leader Yusuf Bey IV, were charged Tuesday with a host of vicious crimes including murder, kidnapping and torture. 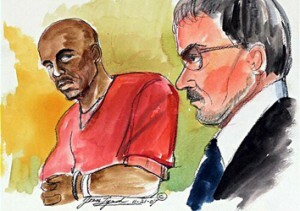 The charges stem from two ruthless episodes since May, including the killing of Oakland Post Editor Chauncey Bailey, who was slain with a shotgun as he walked to work in downtown Oakland on Thursday morning.The other charges stem from an alleged May kidnapping and torture in which several members of the bakery kidnapped two women using a car modified to look like a police cruiser. The suspects charged Tuesday were arrested by police Friday during a raid of the bakery in which police say they found weapons, unsanitary conditions and, eventually, Bailey’s killer and the weapon he used. Devaughndre Broussard, 19, a bakery handyman who police said confessed to killing Bailey, was charged with the murder. He also was charged with being a convicted felon in possession of a firearm and with having a prior felony conviction out of San Francisco. Broussard told police he killed Bailey because the journalist “slandered the Your Black Muslim Bakery,” court documents state. Bailey had been working on a story about the bakery’s financial troubles and internal bickering over who controlled the operation. Clad in a red jail jumpsuit, Broussard glared at a row of journalists taking notes as he told Alameda County Superior Court Judge Morris Beatus that he would seek a private attorney for his defense. He is being held without bail and is due back in court Monday to enter a plea. If convicted, Broussard could spend the rest of his life in prison. A couple of hours after Broussard appeared, the group’s leader, Bey IV, stood before Beatus as he was charged with numerous violent crimes including kidnapping, car jacking and torture. Tamon Oshun Halfin, 20, and Joshua Bey, 21, brother to Bey IV, were also charged with kidnapping, car jacking and torture. Bey IV asked for a private attorney and is due back in court Monday. Halfin asked for a public defender and is due back in court today. “He can’t even understand the gravity of what he is in,” Washington said. If convicted of kidnapping, the two Beys and Halfin could face life in prison. Halfin’s aunt Carrie LaBauve, also described her nephew as a naive young man and said she could not believe he would act so violently. According to police, however, all three men admitted to the kidnapping and torture of the women — a mother and daughter. Under questioning after Friday’s raid, Halfin, Bey and Bey IV all said they kidnapped the women and beat them, court and police documents state. As described in a police affidavit, the women endured a harrowing evening of threats, beatings and torture as the three men demanded money that Bey IV said was needed for the bakery. The men believed the women had “a lot of money” and that a male friend of theirs also had a lot of cash. The women were abducted on May 17 after leaving a bingo parlor at Foothill Square in East Oakland. They were driving on Interstate 580 when they saw what they thought was a “police car” with flashing lights pull them over. Both Halfin and Bey said they were directed by Bey IV to watch the women’s car and to notify him when the two women left a bingo parlor, police records state. Both said they followed the orders because they were trying to get money for the bakery. Once they stopped the car, two men wearing dark clothing and masks ordered the women at gun point into the “police car” where a third man was behind the wheel. Both women had their heads covered to prevent them from seeing their abductors, the affidavit states. As two of the men drove the women away in the fake police car, the third suspect followed in the women’s car. They drove to a vacant house in the 6800 block of Avenal Avenue in East Oakland that the bakery owns and rents out, police said. Once there, the mother was left in the car while the daughter was taken inside the house for a night of torture that began when she said she did not have any money to give the men. When the suspects thought the woman was being uncooperative, she was hit in the head and knee with a hard, flat object, police documents state. She was also told she would be set on fire and that a hot roller iron would be forced into her. The torture was interrupted by an Oakland police officer in the area looking to recover a stolen car. The officer saw the fake police car and stopped to see what was going on. The suspects inside the house spotted the police officer and fled. The kidnapped woman broke a window and called for help. The other woman — still in the phony police car — was found unharmed by police. Police linked the three men to the kidnapping using cell phone records and vehicle registration information. The fake police cruiser was registered to Bey IV and a cell phone found in the house belonged to Joshua Bey. All three men continue to be held without bail. But the kidnapping case isn’t the only one that could be pinned to the three. Bey IV is awaiting an Aug. 17 trial in San Francisco in an assault case, according to the San Francisco District Attorney’s Office. He was also found guilty in Vallejo of a number of crimes in what was described as a scheme to buy a Mercedes using false credit information and identification. Bey IV also was found guilty of trying to open a bank account with false identification. Vallejo police also found an illegal 9 mm semi-automatic pistol and ammunition in the car but charges on that recovery were dropped because police could not connect the weapon to Bey IV. Police also are still investigating two homicides that occurred in July within a few blocks of the bakery. Though none of those arrested Friday has been booked with those crimes, police said Monday the slayings could be connected to the bakery. Meanwhile, Broussard also has a history of violence. Debbie Mesloh, a spokeswoman for San Francisco District Attorney Kamala Harris, said Broussard pleaded guilty to an assault charge in January 2006, and served one year in San Francisco county jail. Broussard was 18 at the time of the crime, and it was his first criminal offense, Mesloh said. Police continue to search for the van used in Bailey’s killing. Although the white Ford Aerostar has not been found, police said they have an idea where it is located. Jordan said police continue to search for three others affiliated with the bakery. Oakland Tribune staff writer Kristin Bender contributed to this report.